Today is the 31st of July 2018 and we are proud to be right on the track of Enkronos ICO roadmap. Our developers are just amazing. They have done a great job and today finished with the release of McAudience App! 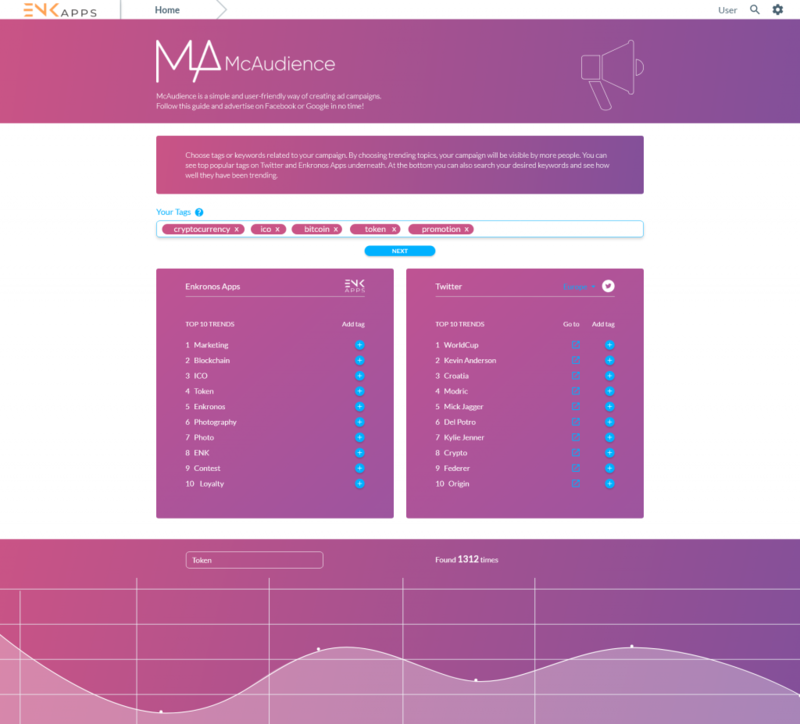 McAudience helps you in choosing the exact tags or keywords that will predifign the Audience you wanted to create. By choosing the McAudience trending topics, you campaign will be visible by more people. We tried to make McAudience App as simple as possible. CHOOSE TAGS – Choose tags or keywords for your campaign. McAudience also suggests you the ten top trends in Enkronos Apps and Twitter environment. SELECT THE RIGHT APP – Select an Enkronos App you want to use in order to promote your campaign. You can choose between: Contest Dream, Loyalty Venue, Your Gamify and Swee. GOOGLE OR FACEBOOK – Choose either Google AdWords or Facebook to launch your ad campaign. START THE CAMPAIGN – In the last step you just add tags in Google AdWords / Facebook and the needed URL address. Choosing the right tag is crucial! And the right tag for a campaign today, will not be the right tag for a campaign next month, since trends are constantly changing. WHY YOU WOULD USE MCAUDIENCE? McAudience is just a starting point for a new relationship and communication with potential customers or users interested in your brand. This is an innovative and unprecedented way to create the perfect audience for your business identity, which allows you to start a new profitable relationship with your customers. You can activate your audience building campaign directly through Enkronos Apps. 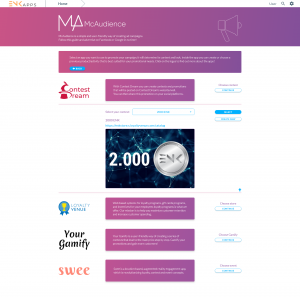 You can activate your audience building campaign directly through Enkronos Apps. Just register yourself here and you can already start building your fist audience.